Truth About It.net will turn a whole five years old at the end of this October. Hard to believe/interesting. Nonetheless, over the life of the site from the 2007-08 season to 2011-12, we’ve seen/lived/suffered through 131 wins, 263 losses, four coaches, two owners, one GM/team president, one Phil Chenier mustache removal, and 56 total players (amazingly, 48 players over the last three seasons). You may have heard of ESPN’s #NBArank project, now in year two. Now hear of #WizardsRank, where we rank each of those 56 players during Truth About It.net’s five-year run. TAI anonymously polled 27 members of the Wizards pixel establishment — from mainstream media to new media, TAI staffers included, to a few pixel consumers (readers of the site) — and got 17 responses. Participants were given the full list of 56 in alphabetical order, and included for each player were total games, minutes, PER (player efficiency rating), and WS/48 (win-shares per 48 minutes) only from the last five seasons. Participants were asked to rate each player on the scale of 1-to-10 according to this criteria: on court performance; off court performance; intangibles; and own personal memory. Yes, this is totally subjective, but relatively collective. NOTE: #WizardsRank Nos. 56 to 22 have been posted and links can be found below. Now, we’ll start releasing player rankings one or so at a time. -Kyle W.
It is easy, maybe even a tad bit lazy, to call Jordan Crawford a “gunner,” a “ball hog,” or even a “ball-stopper,” after just 90 games in a Washington Wizards uniform. The more responsible course of action is to examine how the monster was created. Crawford was delivered to the Wizards (along with Maurice Evans, the 18th pick in the 2011 draft, and two games worth of Mike Bibby) via a trade that shipped Kirk Hinrich and the $8 million he was owed for the 2011-12 season along with Hilton Armstrong to the Atlanta Hawks. Crawford appeared in just 16 of the Hawks’ 52 games and averaged 10 minutes and 4.2 points per game, which is a nice way of saying he warmed the bench. But hey, he was a rookie on a playoff team. Still, even in his first few games as a Wizard, Crawford’s boost in minutes and points (12.8 minutes and 4.5 points) were marginal at best. That would be acceptable for any other 27th pick in the NBA Draft, but perhaps not for the man who once fearlessly dunked on LeBron James. As his second full season as Wizard begins, and as Bradley Beal lurks, Crawford doesn’t know whether he’ll be a starter, a sixth man or a footnote, and his overall role is highly uncertain. But at some point this season, maybe even during several points, the Wizards will need him to deliver a high volume of points in a short period of time to help win a game (or as Crawford would say, let us know “what it was“). And if he knows he’s going to get shots, maybe then he won’t need assistance getting to the airport. No. 56: Cedric Jackson; No. 55: Mike Bibby; No. 54: Paul Davis; No. 53: Edwin Ubiles; No. 52: Quinton Ross. No. 51: Mike Wilks; No. 50: Mike Harris; No. 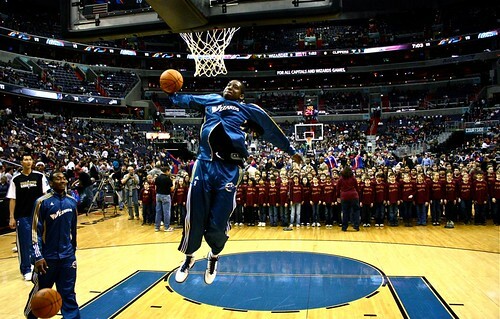 49: Javaris Crittenton; No. 48: Dee Brown; No. 47: Morris Almond. No. 46: Larry Owens; No. 45: Mustafa Shakur; No. 44: Brian Cook; No. 43: Hamady N’diaye; No. 42: Rashard Lewis. No. 41: Hilton Armstrong; No. 40: Oleksiy Pecherov; No. 39: Mike James; No. 38: Fabricio Oberto; No. 37: Ronny Turiaf. No. 36: Lester Hudson; No. 35: Yi Jianlian; No. 34: Juan Dixon; No. 33: Josh Howard; No. 32: Chris Singleton. No. 31: Al Thornton; No. 30: Shelvin Mack; No. 29: Mo Evans; No. 28: Mike Miller; No. 27: Alonzo Gee. No. 26: Randy Foye; No. 25: Dominic McGuire; No. 24: Andray Blatche; No. 23: Earl Boykins; No. 22: Roger Mason.